Bid on the Ebay Auction for Action Comics #1, Richie Rich! 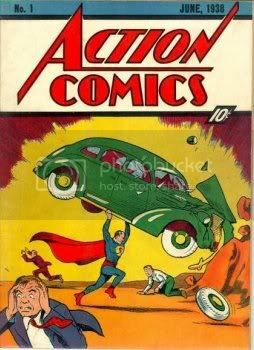 Hot on the tail of last week’s news that Jerry Siegel’s heirs had been awarded the copyright to the Superman material in Action Comics #1, Silver Age Comics is auctioning on Ebay a Very-Good-condition copy of that very same issue, the holy grail of comic book collectors everywhere. More mindblowing is that this particular copy comes from a collection that includes issues #1-200. My jaw drops in awe. Last I checked, bidding was up to $48,000. Which is, like… 100 Canadian dollars, these days. So, some lucky Canuck has about three days left in the auction to scoop up quite a deal. Thanks to Random Good Stuff for the find. My usual offer: a hug and a high-five. Next post: Reader Poll: What Are Your Top Five Favorite TV Shows? Previous post: Top Ten: What Would Batman Twitter?